For various defense operations such as border patrolling remotely controlled unmanned vehicles are used which are known as aerial drones are used. Target drones are subclass of aerial targets that are specifically created for Research, Development, testing & Evaluation (RDT&E) purposes. This encompasses many applications such as target and decoy, training, reconnaissance. The primary factors that have been driving the growth of this market include increase in spending of aerial target developments, initiatives for unmanned combat aerial vehicle programs and emphasis on testing & evaluation and training. Americas is the dominating market which held a major revenue share in 2015 mainly driven by investments in Special Forces, UAVs and fighter aircraft able to carry ground attacks. APAC attributed the fastest growth rate resulting from developing nations such as China and India developing indigenous air based defense equipment to reduce their import spending on defense. This growth was followed by Europe and RoW. The global target drone market was estimated to be $ 4.05 billion in 2017 and is expected to grow with CAGR of 8.51% during the forecast period. Target Drones are unmanned aerial vehicles which are controlled from a remote location. Target drone is intended as a system with ground to air defense role and for training purposes. These are employed by the professionals for testing combat and for training of anti-aircraft crews. The technology has aided to the manufacturing of target drones getting more efficient and the designs are also marvelous with computer assistance. What are the major applications for Target Drones? Target drones are primarily being used by the armed forces to support the operational activities of new weapon systems. They are high performance unmanned aerial vehicles hence are being applied for advanced applications such as aerial filming and data sensing. Aerial mapping drones are high end drones and are enabled with features such as GPS and RTLS embedded on the system similarly loaded aerial survey drones are also available for military as well as commercial applications. The military generally use these target devices for training purposes and also for calibration of equipment. Fuel cells are becoming more practical and will be employed soon as the primary source of power. Fuel cells are still expensive and are slower to respond to load changes. HES Energy Systems is a Singapore-based company which recently announced manufacturing of hydrogen fuel cells for drones that are the smallest and lightest for the power delivered or energy stored in the world. Aerialtronics is employing drones for industrial inspection in various fields. They have a UAV that can autonomously fly around wind turbines and cell towers, detect faults and generate reports more quickly. Artificial Intelligence enabled smart drones will be able to navigate and solve tasks more autonomously. These type of drones are increasingly gaining popularity and are expected to intervene in the target drone market soon. A contract to work with the Defense Department on a pilot, dubbed “Project Maven has been secured by tech giant Google. The contract is aimed at assisting the U.S. military to use the artificial intelligence systems. The project will be responsible for target drone strikes, and analyzing the massive trove of video recorded by surveillance cameras. In many ways modern consumer drones are becoming more advanced than far more expensive military systems. The best consumer models are now being redeployed for commercial use, often with little or no modification. And just as with smartphones, people who enjoyed playing with consumer drones realized it made sense to take them to work too. Even military users are beginning to pay attention to developments in the consumer market and regulatory bodies such as FAA have been set up to prevent misuse of different types of drones. Sensofusion from Finland was recently included in a group of companies selected by the U.S. FAA for a cooperative program aimed at the development of drone protection, location and prevention for airports. The objective of FAA is to find a system that can be deployed on air bases to spot, block and drop the unwanted unmanned aircraft systems before they get anywhere near the boundary fence, never mind into controlled airport airspace. The other companies added to the FAA Pathfinder Program at the same time include Gryphon Sensors and Liteye Systems. 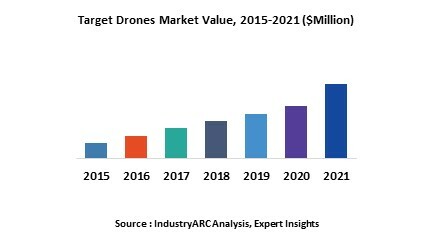 Who are the Major Players in Target Drones market? The players profiled in the report include Boeing (U.S.), Lockheed Martin (U.S.), Northrop, Grumman (U.S.), Meggit (U.K.), GoPro, Intel, Ambarella, FLIR, Workswell. 23.10. Kratos Defense & Security Solutions, Inc.